Author Information: James Dashner is the author of the 13th Reality series. This fall he recently published the first novel of a trilogy, Maze Runner. The second book of the trilogy is titled The Scorch Trials and scheduled for release in late 2010. Overview: What if you woke up in a mysterious elevator and all you could remember was your name? This is what happened to Thomas. Thomas wakes up in a moving lift and only remembers his name. When the lift doors open up he is surprised to see a half dozen faces staring at him, all boys between the ages of 12-18. Although Jason can't remember who he is, neither can any of the other boys. They instantly welcome Jason to the world known as the Glade, which is an enclosed area that is surrounded by stone walls. Thomas quickly learns that life in the Glade is anything but happy. The young teens have learned to adapt to life by learning to make their own food, clean up, and most importantly to never go into the outside maze, that's reserved for the Runners. A maze of shrubs surrounds the Glade and is filled with mysterious creatures that are deadly. The Runners spend all day running through the Maze trying to find a way out, but it is essential that they return before it gets dark or the creatures will surely kill. The day after Thomas arrives a mysterious lift comes back down to the Glade. This has never been done before. All the other times the lift has delivered one boy every month. This time things have changed. Not only does the lift arrive early but it carries a girl. Something about this girl's presence to the Glade will change everything for the children. Format: Maze Runner is a YA novel it stands at 374 pages long. The second novel of the trilogy The Scorch Trials is scheduled to be released in Fall 2010. Analysis: Maze Runner is an incredibly hard book to describe and analyze without having too many things spoiled. 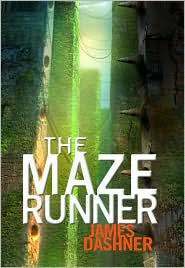 When I first heard about Maze Runner I really wanted to try out this novel. However my experience with this novel is mostly mixed for a number of reasons. The majority of the plot of Maze Runner revolves around a major mystery that is unknown to both readers and the characters. The key to any type of mystery book is the way that information is revealed at a pace that is mysterious but yet keeps the plot moving at a decent pace. Unfortunately Maze Runner does not fall into this category of mystery book. There is a constant withholding of information. I understand that this is partly what makes a mystery a mystery is the withholding of information, only at page 200 I was just as clueless as what was going on as the characters and instantly my interest started to jump to other things. Sadly the plot of Maze Runner at the core is fairly interesting but it wasn't handled in the right way. With a different approach to information or story telling this book would have been wonderful. The characters of Maze Runner are all fairly flat. No one really shows emotions and the main character acts the same from beginning to end. There is no growth or change that makes this novel any different. This combined with the lack of information made it a frustrating read. That's not to say this book is completely terrible. It takes patience, a lot of it. I really think the whole idea of Maze Runner, while a bit predictable for some readers, would really keep readers wanting to read more. The underlying plot is a bit creepy and the idea is there it's the execution of the story that makes it hard to overlook. The end of the novel ends with a bit of a mysterious ending and really there are just as many questions at the end of the book as there were in the beginning. Overall I wanted to like Maze Runner but the lack of information and flat characters held me back from that. However, my curiosity will probably get the better of me and I'll check out the second book depending on time and what I have to read at that moment.